The world of influencer marketing has become part of our everyday lives, with celebrities and micro influencers nudging us to buy products they love and actually use. Brands are able to tap into new audiences through influencers and can increase brand awareness, leading them to impactful results. However, often times brands are so focused on getting their product in the hands of influencers that they lose sight of what determines success (or ROI) with their influencer campaigns. 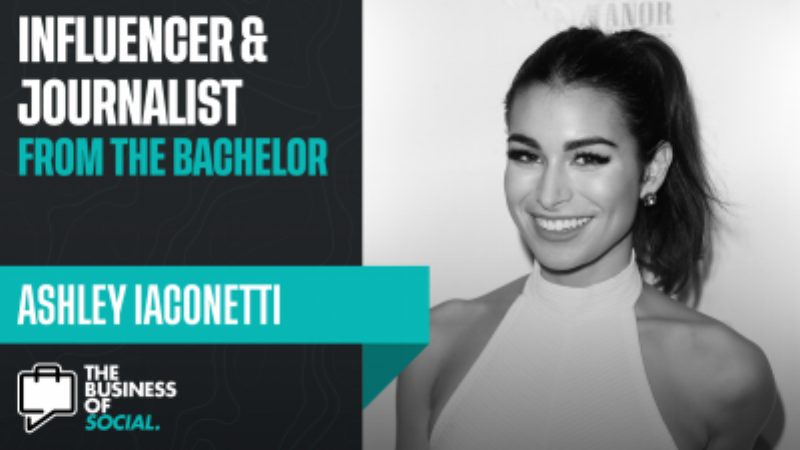 On this edition of the Business of Social podcast, we chatted with Ashley Iaconetti (from The Bachelor) to discuss how brands can be successful with their influencer marketing strategy, what platforms work and more. I know they want it to look pretty and be very PR friendly, as if its an ad in a magazine. But that ad in a magazine is different because I have a very specific following. I understand my audience so well at this point, that they’re just going to swipe right by [your PR friendly post]. If you’re a brand out there and you’re working with influencers, I would suggest you allow them as much creative freedom as possible. Those are the posts that you’re going to get the most engagement on. Think a little out of the box and let the person’s personality shine through. Those are the ads that are going to do the best. I had a Beyoncé recreation ad that I did, and the amount of likes that I got on that picture are the equivalent of the amount of likes that I would get on a post when I was fresh off The Bachelor. It was that kind of attention that that post got. Not only that, it translated so much into sales. I don’t know how many followers I had on Snapchat. I was averaging 70,000 views per snap. This was before Instagram Stories even existed and then as soon as Instagram Stories came out, my views went down 40,000. So, I was like, “Hmm. I’m not going to use Snapchat anymore. It’s got to be Instagram. I don’t understand Snapchat. As someone in their upper twenties, I never really got fully entrenched in Snapchat. There was maybe a year there where I was using it regularly, but I think all the traction is on Instagram. The way that they have it set up, so that you can tag to go to another profile and then you can swipe up to even listen to something or visit the website. I know that Snapchat just integrated the new website link, which… thank goodness because if not, I found it to be honestly pointless in like half the things that I promote. I stopped [using Snapchat] once Instagram Stories was released. I started using the swipe up, I basically, abandoned Snapchat. I’m not going to just type in a long URL on top of a Snapchat picture. On the topic of Facebook, I am confused why brands request a multiplatform contract. I don't get why I need to do an Instagram Story, Snapchat story, a Instagram post, and then a Facebook LIVE. I’m like, “Facebook Live? really?” I never use Facebook anymore. I’ll post if I want my friends and family and my parents and their friends to see something. I just don’t think it’s a millennial platform anymore. My biggest fear is that Instagram does too much and that Instagram will end up turning into their parent company (Facebook). If I were a fan, I believe that I would probably be more affected by podcast ads. We’re just able to put a lot more detail in there and you can hear the excitement in our voice. I think you could honestly tell when Ben and I are excited over a company. For example, we love MeUndies, it is my favorite underwear. We also love Omaha Steaks and I feel like that really comes through when we are discussing it (genuinely) together. I think there’s something about the (natural) discussion of the product as well. So, I think those are the strongest ones in my opinion. Okay, this is insane. I had like 75,000 followers, just coming off my season of The Bachelor and I was asked to do a promotion for Hulu. I got paid $500 to do it and it was just a picture of me watching a show on my computer screen and I was like: “You are going to pay me $500 to put a picture on my Instagram?” It was the coolest thing.